Meetings take place in the Valhalla Room at the Scandinavian Centre, 739 20th Ave NW, Calgary. Monday May 6, 7:30 p.m.
Monday June 3, 7:30 p.m.
Scandinavian Centre Spring Concert, 7 p.m. Friday April 26. Children’s and adult choir, Scandinavian Spelman, refreshments, door prizes. Tickets are $10/adult, free for age 16 and under. Purchase by e-transfer to awiigs@telus.net, at the Scan Centre during office hours, or at the door on concert day. Doors open at 6:30 p.m.
Supper tickets are $20/adult nonmember, $15/adult Valhalla member, $10/ages 6-15, free for under age 6. Sports Weekend in Meota, SK (near North Battleford), June 7-9. $60/person registration fee will be collected at the May 6th lodge meeting. Hurray for the Canadian team at the Harbin Ice and Snow Festival in China! Scott Harrison (son of members Trish and Dean) and his teammate Steve placed third out of 34 international teams. Here are links to news footage showing ice sculptors at work and photos of the festival. At last, my chance to see where Sons of Norway began. The convention headquarters was a modern hotel in Bloomington, just south of Minneapolis. The optional leadership workshop on Aug. 15 was well attended and offered a great variety of speakers on subjects such as successful community service projects, taking good photos for the Viking, and using modern media. In the evening Russ and I had dinner and a tour at the huge new Vikings football stadium (US Bank stadium). We glimpsed many areas one would never see if a game was on. We used Thursday to explore the light rail system, from the hotel to the downtown terminus, then the line to St. Paul, ending at the beautifully refurbished train/bus station. The return trip included the Mall of America, just two stops past our hotel. In the evening charter buses took everyone to the historic Landmark Center in St. Paul for the President’s Reception. The delegates met on Friday and Saturday to discuss resolutions and bylaw changes. The committees had worked diligently to group similar proposals together and make recommendations. In other cases, a variety of topics deemed uncontroversial were grouped together in a ‘consent agenda’. Any delegate could ask that an item be pulled for separate consideration. Simplification of the Norwegian and Canadian fee structures was part of a consent agenda and passed without comment. Beginning in 2020, individual memberships will rise to $58 Cdn. Of that amount, $10 comes back to the lodge and $8 to the District. Family memberships (all individuals living in the same household) will be $88 (with $20 to the lodge, $16 to the District). Current Golden Members will remain with their current reduction percentage of dues. Ron Stubbings, of Port Coquitlam, BC, is our new International President! He cycled 2800 km, almost the entire route from Vancouver to Minneapolis, as a fundraiser for the Canadian and International Sons of Norway Foundations. Marci Larson and Elaine Nelson returned as Secretary and Treasurer respectively. Mark Agerter is Vice-President. Hamar, Norway, is the site of the International Convention in 2020, August 16-23. What a beautiful place to celebrate the 125th anniversary of Sons of Norway! Thank you for the opportunity to represent Zone 4, District IV at the 2018 International Convention. 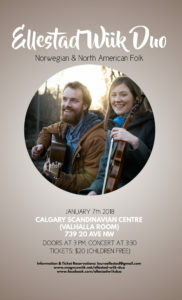 January 7 at the Scan Centre, Valhalla room. A most enjoyable afternoon of music and song – here’s hoping they will come back again. Ski for Light – Monday February 6. Thank you to lodge volunteers who provided lunch and transportation for visually-impaired skiers assembling at the Scan Centre. Fjord horse farm/cowboy dinner – July 24 Click on the link Valhalla Fjord Horse Event – July 24, 2016 for Ron Reine’s photos. Syttende mai 2014 was a very special time!